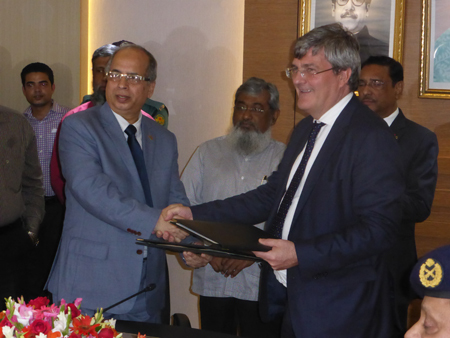 The Bangladesh Bridge Authority has signed a contract for management support consultancy services on the US$ 2.9 billion Padma Multipurpose Bridge Project with Rendel, BCL Associates, Padeco and Katahira & Engineers International. The Padma Multipurpose Bridge Project will be the largest bridge in the Ganges-Brahmaputra-Meghna river basins and a very challenging construction project. It will be located approximately 40km south west of Dhaka and will connect the south-western region to the rest of Bangladesh in order to facilitate economic growth through the transport of people, goods, natural gas and telecommunications. It will be a 6.15km-long, two-level, steel truss bridge with a four-lane highway on the upper level and provisions for a single track railway on the lower level. The upper and lower levels will act compositely with a reinforced concrete deck slab. As well as rail and road, the bridge will carry utilities including high pressure gas pipe and telecommunication lines. In addition to the construction of the bridge itself, there will be an elaborate system of associated road constructions including two toll plazas and bridge end facilities, a 13.6km-long, four-lane, dual carriageway approach road, culverts, small bridges, under passes, service roads and service areas for residential accommodation. Complex river bank protection/training works 14km long will also be constructed. Rendel will provide project management of the entire scheme including contractual and commercial advice; engineering and technical support and advice; budgetary and financial management; quality control and assurance; advice on dispute settlement; and the implementation of the social safeguard plans (environment, resettlement). The company will also be responsible for BBA staff and designing a programme for the social-economic aspects of the project. Rendel’s contract is for approximately three and a half years, from March 2016 until December 2019. 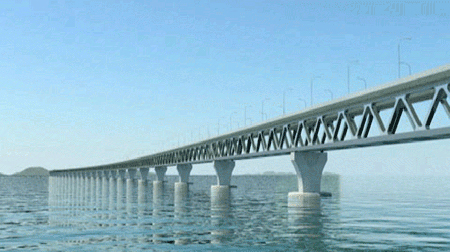 Construction of the Padma Bridge began at the end of 2015.